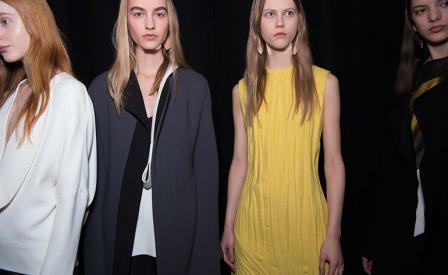 Mood board: It’s all about the nuances at Narciso Rodriguez. The die-hard minimalist experimented with plisse wool textures and asymmetric shapes this season, showing plenty of bias cut dresses that grazed the body while swarthy wrap coats enveloped it. As reduced as shapes were, their simplicity was amplified by a variety of interesting materials, such as crushed paper silk and a laminated matelasse that brought a subtle new dimension to the garments. Finishing touches: The architectural austerity of the collection was juxtaposed by the choice of accessories. Slouchy, dual-tone bags that models toted under their arms were softly structured, while oversized silver and onyx earrings by Ana Khouri brought a graphic edge to the table. Best in show: Rodriguez has always been known to for his love of femininity, but this season, he seemed to embrace more androgynous shapes such as a long, hooded, almost windbreaker-like coat (elevated in shiny, textured matelasse, of course), fluid, but broad shouldered wool jackets and a variety of trouser shapes that were perfect options for eveningwear.